Pie. That was the only way my mom ever used a butternut squash. Her squash pie is like pumpkin pie, only much better, in my completely unbiased opinion. I’ll post that recipe in the future, when I finally learn how to make a piecrust that doesn’t resemble cardboard. Way back in the 1990s, on an episode of In Julia’s Kitchen with Master Chefs, one of her guest chefs (whose name escapes me–so sorry!) sautéed cubes of squash with shallots and garlic, of all things, for a savory side dish. What a revelation. Since then, I’ve roasted and sautéed butternut squash in various savory ways. It holds up well to garlic, chilies, and thyme. When puréed it makes a rich and creamy soup. This dish was an exercise in pantry- (and freezer-)clearing. I needed to make dinner, but nothing was thawed and the veggie drawer’s contents were uncharacteristically sparse. I always have chicken andouille in the freezer and cornmeal in the fridge. 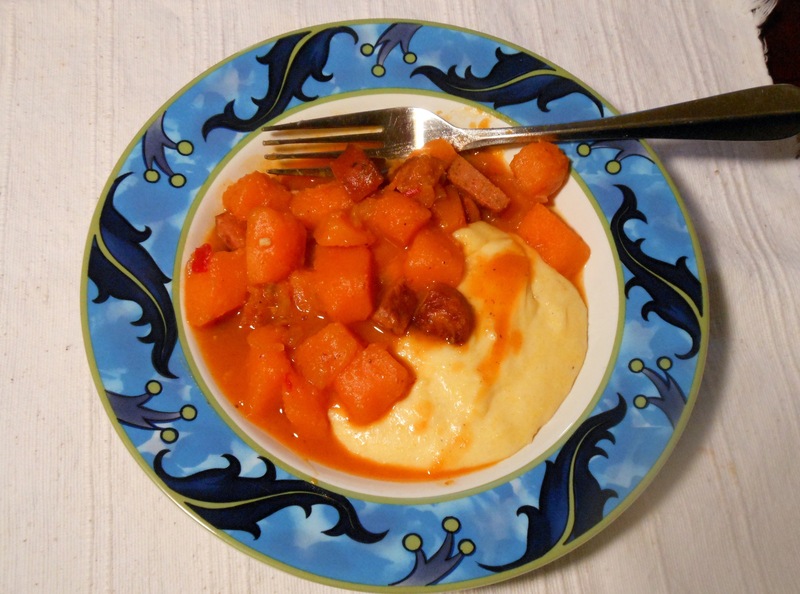 Spicy andouille is a lovely foil for the sweet squash. When cooked together with a little liquid, the result is a richly satisfying stew that’s filling without being heavy. When you use chicken or turkey andouille, it’s a healthy dinner to boot. I’ve made this twice in the last few weeks, once with red bell peppers added, and once without. I’ll try it with some kale, or maybe with chickpeas. A splash of white wine at the beginning, or sherry at the end, would contribute a subtle hit of acid, but it’s not necessary. We’re unabashed carb-lovers in this house, so the idea of serving a stew without starch is incomprehensible. I contemplated serving this with popovers, but decided on polenta. For a creamy texture, use a 4:1 liquid to cornmeal ratio, and use milk as at least half your liquid. You could certainly use all milk, but chicken stock adds flavor, and a little water lightens the texture and lowers the calorie count. Montery jack enhances the velvety texture but is mild enough not to compete with the flavors of the stew. You can make the polenta hours (or a day) ahead, pat it into a disc about an inch thick, and let it cool. Then cut it into shapes and sauté them in a hot pan glazed with oil until browned and crisp. Peel the squash, then cut in half. Scoop out the seeds and cut the flesh into small cubes 3/4 to 1 inch. You’ll need about 4 cups. Sauté the sausage in 1 tbs. of the oil in a large skillet over medium-high heat until browned on both sides. Set aside. To the same pan add the remaining tbs. oil. Stir in the onion, garlic, celery, and chile (if using) and cook for 3 to 5 minutes until softened. Add the squash, give a good stir, and stir in about half the stock, all the honey, and a few healthy pinches of salt and pepper. Lower the heat to medium, cover the pan, and cook for about 10 minutes. Meanwhile, pour the 1/2 cup stock, 1/2 cup water, and the milk in a medium saucepan over medium-high heat. Keep an eye on it; you want it to reach a decent simmer, but not a full boil. Taste the squash and add salt if necessary. Add most of the remaining stock, stir in the sausage, and cook, uncovered, for another 15-20 minutes, stirring now and then, until the squash is very tender and the liquid is reduced and thickened. I mashed a few cubes of the squash with a fork to speed up the thickening. While the squash cooks, slowly whisk the cornmeal into the simmering liquids. When it’s all added, whisk vigorously until the mixture is thick and smooth. Whisk in the salt. Reduce the heat to medium-low. Switch to a spoon (preferably wooden) and cook for about 15 minutes, stirring frequently. Meanwhile, stir the squash every now and then, and add more stock if it’s too dry. Taste the polenta. It should be smooth and not gritty. When it’s at the proper texture, stir in the cheese a handful at a time, then add the butter. 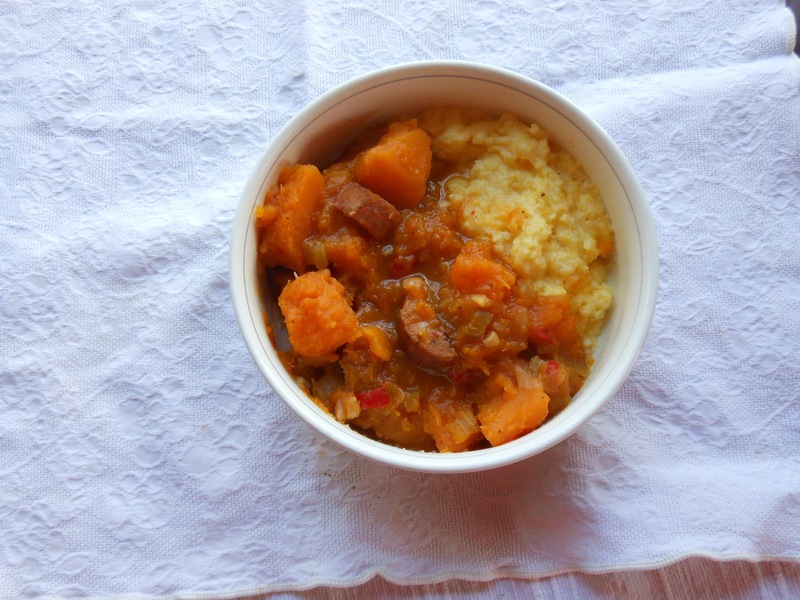 Spoon the polenta into bowls, and top with the squash and sausage. This entry was posted in main courses, meat, poultry,and fish. Bookmark the permalink. I was just browsing through your blog and stumbled onto this recipe. I didn’t grow up eating grits, or polenta so they’re both a little foreign to me. I’m starting to toy around with the idea of learning though and putting some foodie twists on them. I love this recipe! All of the perfect textures/flavors together and the butternut squash is an interesting sweet twist. Any advice on making really good, really creamy polenta? I find that using milk (even fat-free) as at least half your liquid makes for a much creamier texture than using all water or broth. A handful of grated cheese adds to the creaminess as well, and a pat or two of butter wouldn’t hurt either. Whatever liquid you use, cook the polenta long enough. Start tasting after 15 minutes, and keep cooking until you no longer feel the grit. I just came across this recipe for creamy polenta in Food 52’s Genius Recipes section. I haven’t tried it yet, but the Genius Recipes I have made in the past have been, well, genius, so I have no reason to doubt this one. Good luck, and let me know what you come up with. Awesome–the milk instead of the broth is a great idea. I’ll try your suggestions and recipe for sure…thanks!